According to the familiar line from the book of Ecclesiastes (3:1), “For everything there is a season, and a time for every matter under heaven.” That observation might help us to understand today’s first reading which, taken by itself, seems to contradict itself. This reading, taken from the second part of the book of Isaiah, begins with a call to remember: to remember what God did in the past for Israel. It invokes what are vivid images from the story of the Exodus: “Thus says the LORD, who makes a way in the sea, a path in the mighty waters, who brings out chariot and horse, army and warrior; they lie down, they cannot rise, they are extinguished, quenched like a wick.” This timeless narrative is an integral part of the Great Vigil of Easter, which we will again be celebrating one week from this coming Saturday. We remember God’s great work of life given to Israel in the Exodus, as we remember God’s great gift of life given to all the world in Jesus’ resurrection. Remembering is essential. Remembering is fundamental to the identity of Israel and also to our identity as Christians. And the prophet calls us to remember. But then, in the very next verse, the reading reverses course. It insists: “Do not remember the former things, or consider the things of old. I am about to do a new thing; now it springs forth, do you not perceive it?” Remember, but don’t remember. There is a time every matter under heaven. But when is the time for Israel not to remember? Old Testament scholar Paul Hanson puts it this way (Isaiah 40-66, p. 73): “Under what circumstances should Israel not remember the former things?” And he answers, “At the point where a nostalgic relation to tradition threatens to tie the people to their past and to stultify alertness to present realities, responsiveness to new opportunities, and the potential for growth into yet-unrealized possibilities.” Remembering, focusing on the past, can become what he calls “a conceptual blindfold” that prevents us from seeing the newness and the richness of the present and the ever-new opportunities and blessings that God opens us for us. Allowing the past to get in the way of the present and of the future is a danger that we face at all stages in our lives, but especially as we grow older. Maybe it’s the simple fact that, when folks get to be my age, we have so much more “past” to remember. But allowing ourselves to focus on the past sets up an opaque barrier, hindering us from seeing the richness of the present and the promise of the future. It is something that can happen in our individual lives, in our lives within our families, in our lives within our communities, and certainly within our lives as a church. All too often, families, for example, find themselves to be prisoners of their past. Some argument or conflict that happened years ago still dominates their relationship with one another today. Refusing to forgive, they allow the past to hold them captive, each in his or her own isolation cell. But there is an alternative. The late writer and theologian Louis Smedes advised: “Forgiving heals your memory as you change your memory’s vision. When you release the wrongdoer from the wrong, you cut a malignant tumor out of your inner life. You set a prisoner free, but you discover that the real prisoner was yourself.” By letting go of the past, we can be set free to live in the present. A similar thing happens all too often to people in churches. Some of them, too, tend to live in the past. And far too many of what we think of as “memories” of the past are actually a form of nostalgia. Nostalgic memories tend to remember the past as we like to remember it, not necessarily as it actually was. But even if those memories are fairly accurate, dwelling on the past can easily blind us to the fact that the past is past. The church is people; and so the church that was St. Mark’s Church 30 or 40 or 50 years ago no longer exists. I recently went through our current parish directory and found that, when Judy and I first came here nearly 23 years ago, over half of those who are currently members of this parish either were not attending here or were not even born. And even the needs and interests of those who have been members for decades have changed as well. That is good. As the 19th-century British theologian John Henry Newman observed, “In a higher world it is otherwise, but here below to live is to change, and to be perfect is to have changed often.” And one hopes that all of us continue to change as, with God’s help, we seek more and more to be transformed into who and what God calls us to be. This realization, that the church of the past is not the church that exists and lives today, carries with it multiple implications. 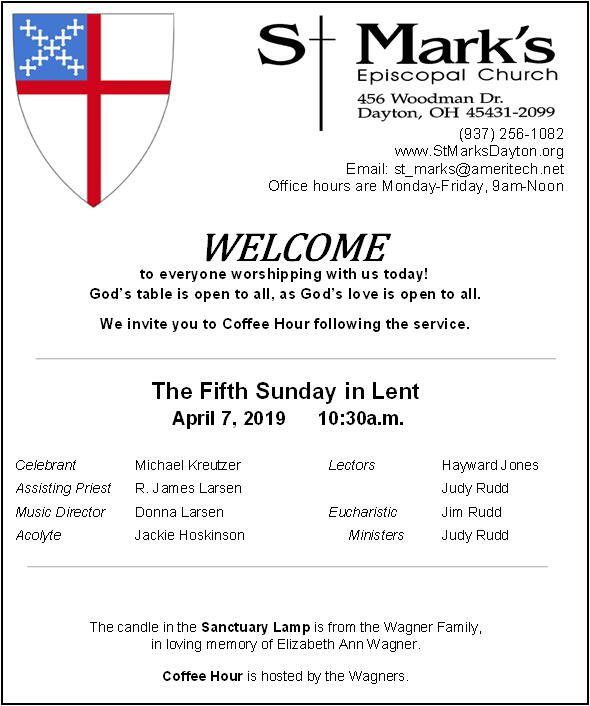 The style of worship that St. Mark’s Church offered decades ago might well have served the needs of that church, but that church is gone; and we have worked to adapt to the changing needs of this changing parish. We have always done so in keeping with our current Book of Common Prayer, which, by the way, is 40 years old this year. The type of music that best suited the needs of St. Mark’s Church decades ago is not the same as the type that best serves the needs of the church that exists here in 2019. And the various ministries that once allowed this parish to fulfill its mission of addressing the needs of this community in years past no longer do so today. To live is to change. And, in order to embrace that life-giving change, we need to remember the past, appreciating it for what it was and learning from it. But, at the same time, we need to stop remembering the past in such a way that we become captives of the past. We need to stop remembering the past in such a way that it obscures God’s work among us and through us in the present, and that it keeps us from changing in order better to experience and witness to and bring to others God’s presence and life and love in the future. Among the many faithful people who have had to remember their past and to remember their rootedness in their heritage is St. Paul. He proudly recalls them in today’s second reading. Yet, at the same time, he “remembers not” the past in such a way that it blinds him to or even obscures the changing challenges and opportunities and blessings of the present and future. Instead, he asserts: “This one thing I do: forgetting what lies behind and straining forward to what lies ahead, I press on toward the goal for the prize of the heavenly call of God in Christ Jesus.” That sounds like an ideal life-plan for us as well.